The team gathered at the big ramp where they could be certain to defend against the Wasps. The Stone was surprisingly agile and he scooted up like a young mountain goat. "Oh," he yelled. "I spy big creepy-crawly things." "Marshall Duetta Spyder" said the Wabbit in surprise. "I thought you were on leave." "You sounded desperate," said Duetta, "so I rounded up some troops and scurried over." The sound of buzzing echoed around the concrete and they paused. "The Wasps are back," said the Wabbit feeling slightly foolish. Duetta rattled her legs and all her troops did the same. "Commander Wabbit," she said in the silkiest of silky voices. "These are not the Wasps we sent to the Sombrero Galaxy." An air of puzzlement hung like a jigsaw. "Then who are they?" asked Lapinette. Duetta snorted. "They are Glyptapanteles, often known as the Voodoo Wasps." "I know them from the Caribbean," said Jenny. "But they're too big." "Who are you?" asked Duetta. "You may call me Captain," snapped Jenny. "And there's me! Don't forget me! " shouted the Stone. "I know you," said Duetta. "I got a circular." 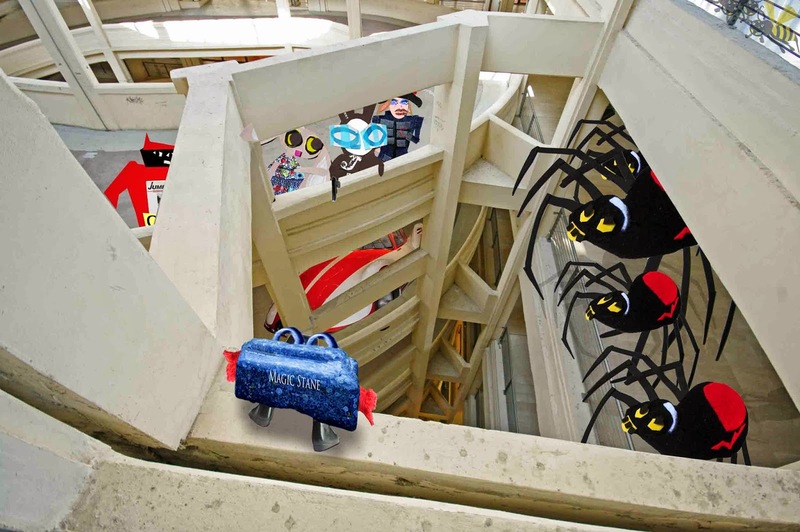 "We have to protect the Stone at all costs," said the Wabbit. The Stone leapt up and down on the parapet and shouted. "We had unco trouble already!" The legs of all the spiders rattled for what seemed like an age. "I'm bigger than trouble," said Duetta.